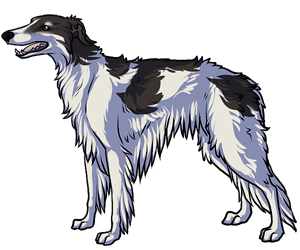 Borzoi's are tall, thin dogs who decended in the lands of Russia. Because of its orgin, they have also been called Russian wolfhounds as a secondary name in America until 1936. Created by mixing Arabian greyhounds with other large and heavy coated russian breeds, the Borzoi was born in the 17th century. They are hounds with high speeds who were used to catch foxes, wolves and rabbits. Today they are still very popular hunting. Hunting packs formed by many Borzoi could number up to over 100 individuals. Until 1936 Borzoi was called by the name of the Russian Wolfhound. The Borzoi wasnt recognized by the AKC until the year 1891.